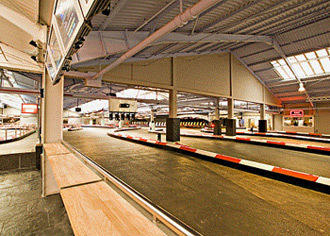 Possibly one of the best indoor go karting circuits that we've seen. An unimaginable amount of money was spent on making this 'simply the best' and it worked. Great facilities and an ideal venue for corporate events and group activities - not to be missed. Please note that crash helemt liners must be worn and can be purchased from reception if you do not have your own. Herringham Road is just off Westmoor Street and the venue is clearly signposted from the A206 Woolwich Road. There are conference facilities for 120.